When you build GT40’s that are the only replicas licensed to officially carry the full Gulf Oil livery it’s clear you can build a serious automobile. When you can also build some of the best custom Ducati’s on the planet it’s clear two wheels or four you’ve got it covered. 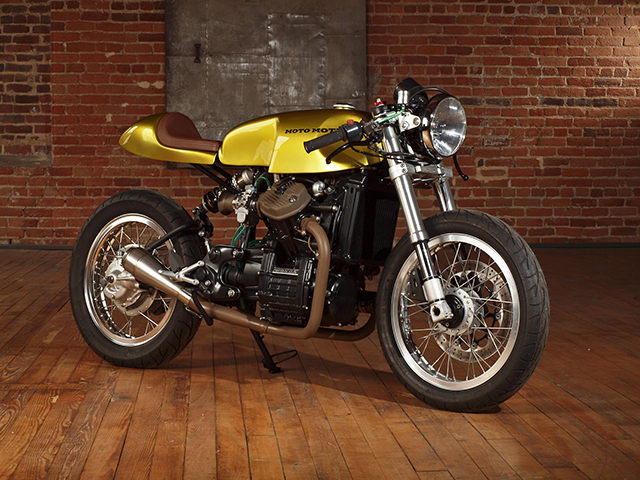 So when a customer told Johann Keyser it was impossible to create a stunning CX500 the man behind Moto Motivo took on the challenge with justified confidence. The donor bike was no ordinary CX500 it was the deluxe model, ‘The Plastic Maggot’, made even worse with a full set of Vetter fairings and panniers. Many builders see the CX500 as a challenge to be conquered; Johann was keen to make that challenge even harder. The 1978 CX had only seen a few years of service when the original owner put it into storage in 1982 after a small incident with a dog on a highway. Having sat for 32 years with oil and fuel still on board it’s a testament to the Honda engineers that it required Johann to fit only a new battery to get the old girl ticking over, but that’s when the real fun started. 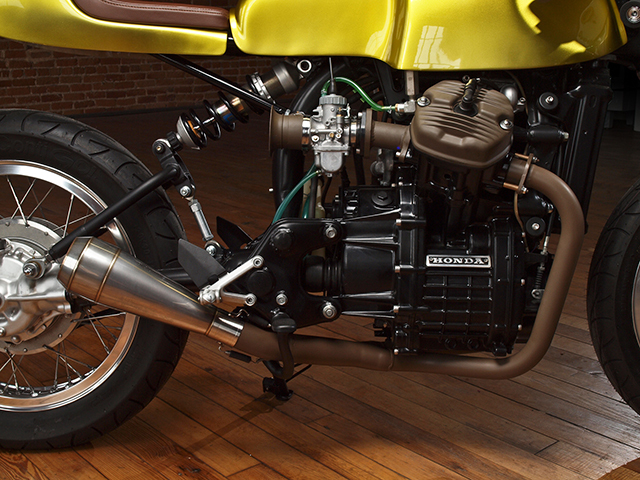 The design idea for the build came from one Johann had intended for a Moto Guzzi build, one that would require a frame up restoration of the old CX. The Honda was completely stripped back and the frame was stripped of all unnecessary brackets, mountings, rear shocks and ugly rear subframe. Johann then designed and fabricated a new swingarm that would now run a mono shock, a fully adjustable Ohlins item straight from a Ducati 900SS. With the frame modifications now complete the whole thing was then powder coated in Satin Black. With the rear end so well sorted it made no sense to leave the front end be, so being the Ducati specialist Johann knew the exact front forks to fit. Taken from a Ducati Monster S2R 1000 the fully adjustable forks also use modified Ducati Triple clamps to fit the CX frame. The front brake is a left side Ducati Sport Classic brake rotor and caliper, while a Ducati radial master cylinder supplies the pressure. Tidying up the notoriously ugly CX front view is the addition of an elegant LED electronic dash that does away with Honda’s factory monstrosity. The appeal of the CX is undoubtedly the V twin engine, without which it is hard to see why anyone would take on the bike. But its Moto Guzzi style layout, smooth torque and reliability give it the sort of charm a Café Racer deserves and stripped of all the excess weight can perform strongly. The motor was completely chemically cleaned and painted in satin black and all exterior motor bolts were replaced with stainless steel bolts. Fuelling duties are taken care of by New Mikuni units fitted to custom aluminium intake manifolds topped off with Velocity Stacks from a Ducati 748. Taking care of spent gases are custom 2 into 1 headers and finishing out the back is a Moto Motivo stainless steel muffler. Johann isn’t a fan of wrapped exhausts so with the help of some friends he chose a ceramic coating colour normally used on firearms to cover the exhaust. The theme then extends to the valve covers, velocity stacks, intake manifolds and other piping leaving an ultra-clean look not often seen on many CX builds. The colour also works amazingly well with the brown leather seat that adds comfort to the custom Moto Motivo fibreglass tail piece. The tank is Modified and 4 inch stretched unit supplied by Airtech and having sliced and diced my fair share of CX tanks I can attest to the workmanship. 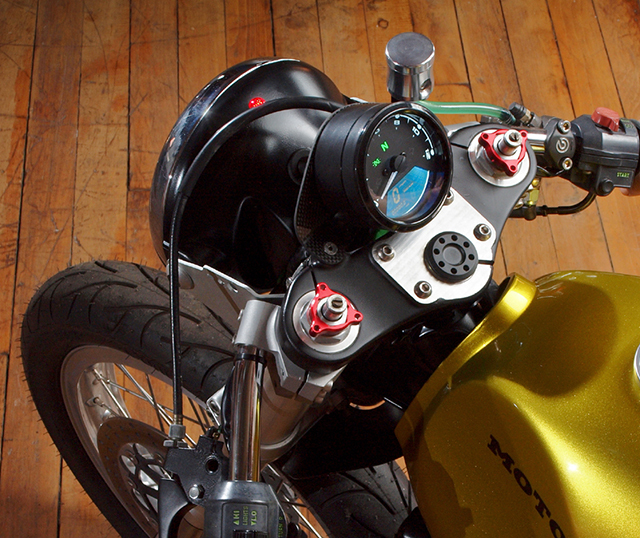 Made with ethanol proof epoxy it’ll handle any pump fuel you throw at it, but Johann prefers his fuel alcohol free! The paint is a Honda factory colour, 1973 Honda SL350 Candy Panther Gold, with Moto Motivo tank decals so you know just who swung the spanners. The rearsets are nothing short of Ducati Superbike items and not even the ugly gearshift unit was left in place. Whereas most builders will use black paint to hide it, a Moto Motivo unit adds both incredible form and function where once both were devoid. 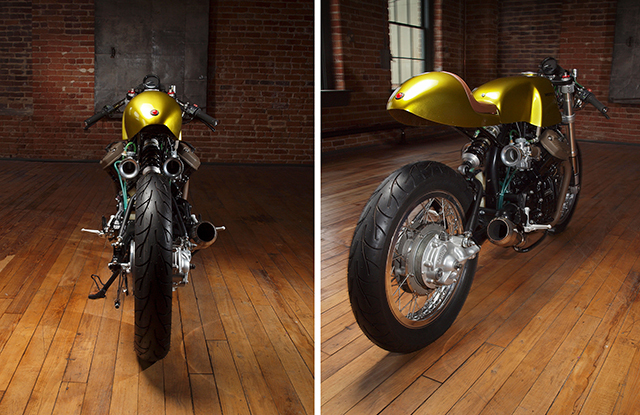 Having been set the challenge to do the impossible Moto Motivo head honcho Johann Keyser believes “This bike truly turned out as the coolest Honda CX500 in the world”. As a fellow CX builder I’m not going to argue, mission complete!